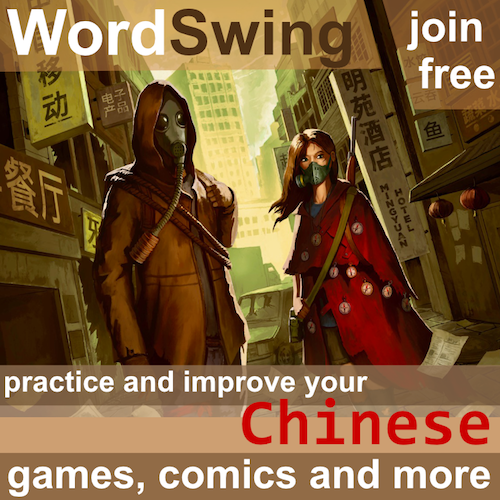 Today, I have the pleasure of inviting you into my shower and show you some neat ways of improving your Chinese. I promise I will keep my clothes on, because even if the tone in the title is playful, what I have to say is important. 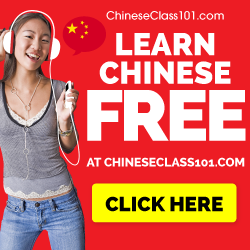 I’ve used my shower to learn more Chinese and in this article I will share my experience with you. 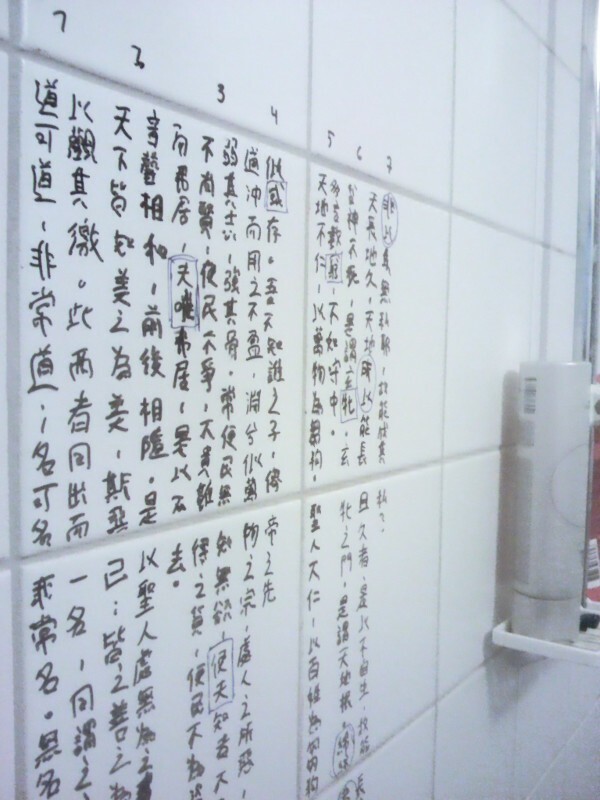 Learning Chinese in the shower might sound exaggerated, but if we lead busy lives (or simply want to learn as much Chinese as possible), I’ve found that whet showering I usually spend minutes just staring into a wall. Now that might be useful in itself for meditative or recreational purposes, but if you want to diversify your learning even more and find time when you really think there isn’t any, using the shower is actually very good. Why not put something on that wall and stare into that instead? The basic concept is simple: Write whatever you want to learn on the walls of your shower (cabin). Daily seeing the characters you have written is quite useful in itself and is a kind of spaced repetition. Of course, you don’t have to actually shower to look at them, it might as well be when you brush your teeth. The process of writing the characters is of course effective in itself, but it also requires time of a much higher quality, so it’s not necessarily suitable for everyone. 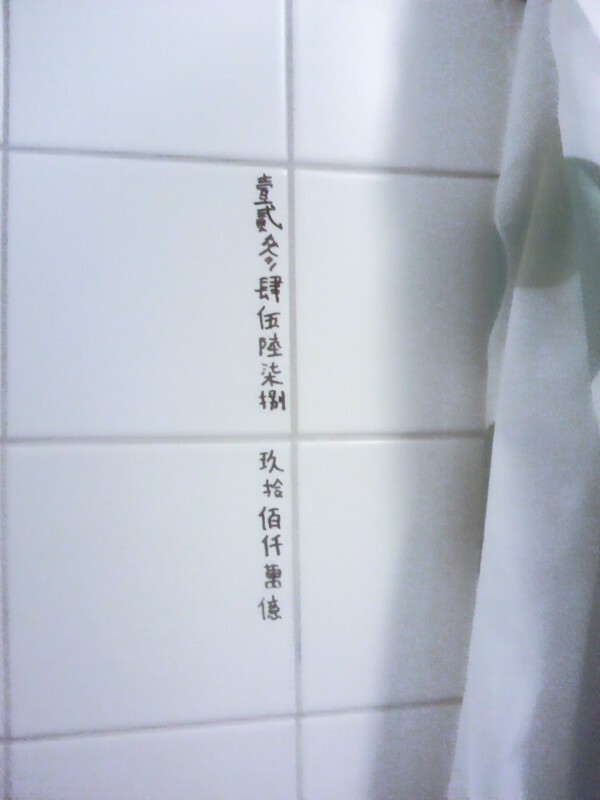 Writing on the walls in your shower works very well in most apartments and shower cabins, but do make sure that you can remove what you’ve written before you get serious. Make a mark in a hidden corner and leave it there for a few days, then try to wipe it away. If you fail, use another pen and try again. Just make sure that you can wipe away what you’ve written, I don’t want you to blame me if your landlord wants to kill you! I’ve found that most whiteboard markers work very well on both plastic and ceramic tiles. We all have our nemeses among Chinese characters (called leeches in Anki). The best way of dealing with these is becoming friends with them. Inviting them to shower with you is a good first step (although I don’t recommend you doing that the first time you invite your normal friends). Whenever you encounter a word that refuses to stick or that you fail over and over again when reviewing, write it on the wall in your shower (with a non-permanent marker, see the above guidelines). Write it big, so that you can see all the strokes clearly. Small characters might look nicer because you can’t see your own mistakes as clearly, but when learning to write, write large characters ( see Learn by exaggerating: Slow, then fast; big, then small). Also, add any extra information, translate, draw pictures. Avoid writing small characters (left). Instead, Write them big and nice so that you can see all the strokes clearly. 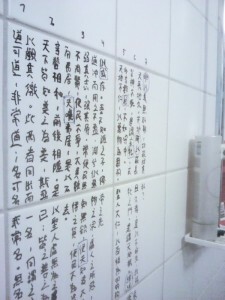 I haven’t memorised many texts in my life, but I have tried learning 道德經 (commonly known as Tao Te Ching in the West). I might talk about this project more later, but I will share the shower part right now. This approach worked really well for me. 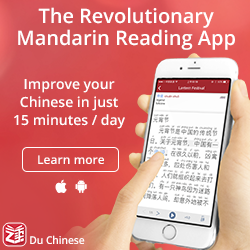 You will need to do more than this to memorise classical Chinese, but it is a good tool to use once you feel that you have understood what you’re reading (memorising things you don’t understand is very hard and a waste of time). This is a real example from my shower. I don’t care about handwriting here at all, so don’t complain about the sloppy characters. I used squares to highlight difficult passages and circles to mark characters I forgot often. I kept these slightly to one side so as not to disturb the other things I was writing on the walls. You probably don’t need to rewrite these often, simply looking at them now and them takes you a long way. Of course, using the shower like this is just an example. You can do the same close to the toilet, in your kitchen or next to your bed. Placing things you need to study where you tend to have a few spare minutes is a very good way of getting more things done. Use the environment around you to make learning natural and easy! Maybe you want to write a post about your learning experiences on 道德經 later on? I paused (or abandoned) the project half-way. I haven’t decided yet if I think it’s worth writing an article about, but perhaps it is. Usually, there is more to learn from failed (or at least partially failed) projects. 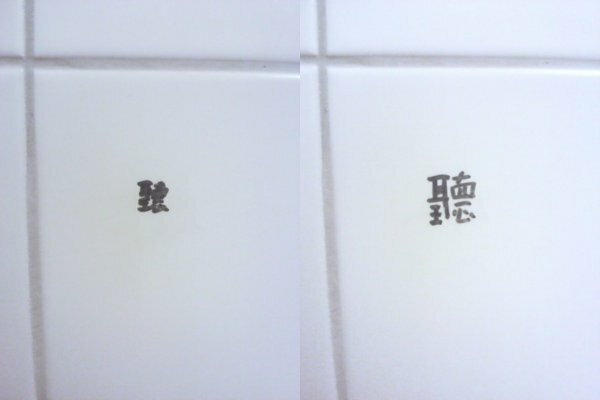 Just to be clear, the shower part of the 道德經 project worked very well, I encountered problems in other areas though. Yes, generally speaking, we learned the most when we failed. Sometimes the learning process can be very painful(especially life lesson), but I think everything happened for a reason. My main problem was lack of grammar for that kind of text. I knew roughly what everything meant, but it became very hard to remember structural words which translated into English ended up meaning roughly the same thing. My prior exposure to classical Chinese is very limited and I think I need a more solid foundation before trying to memorise something like 道德經. Classic Chinese, especially those were written in ancient times, is pretty concise and short of structured grammar rules (however, they do have a rule of their own though). You can wait a while to resume your learning or you can take a short section at a period of time and memorize it. Not many people memorize all of it, not even myself either. The essence is to understand it and applies it into life as needed; as for memorization, it is not a priority to me. However, if you really like certain passages of the text, you eventually will end up remembering them, just like I did with some poems. Have fun – it is the key of learning. I already know the meaning since before I started learning Chinese. 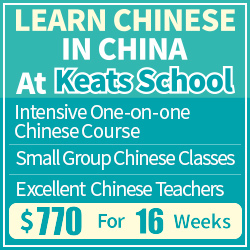 This was mainly an experiment in memorisation and classical Chinese. I think part of the problem is that 道德經 is notoriously obscure, even more so than other works from the same period. I haven’t read the Analects in full, but what I have read was considerably easier than 道德經. Of course, this is because of the topics discussed, but I also think it’s because of the language itself. I first read this on my kindle which is text-only. I must say it becomes a lot clearer with the photos! Besides the philosophical subject itself, Tao Te Ching uses a lot of allusion to a corpus of ancient literary works. Nowadays, not many people have deep understanding with ancient classic Chinese literature, and that is one of the reasons makes it difficult to interpret the text. There are about 5000 characters in the text. It is a very hard task to try to remember it all. Good luck. Before I stopped (temporarily? ), I had successfully memorised the first 37 verses. I suppose I’ll have to spend quite some time reviewing that if I pick up this project again, though. Perhaps a winter/summer vacation project! Thanks for your input and encouragement, by the way! I’ve often wished a shower tile or two were touchscreens so I could skritter in the shower 🙂 Maybe one day…. We are having glass panels fitted instead of ceramic tiles in a new shower cubicle. Not such a big step to having an interactive screen perhaps? Useful idea. Hope I can put it into effect soon (very busy now). Thanks for sharing it.